Made from a remarkable lightweight Pertex Shield fabric, Montane's Men's Atomic Pants feature thigh-length side zips for versatility and ease of use during any activity in the mountains. Pertex Shield is lightweight fabric that stikes an excellent balance between breathable waterproof protection and durability. A dry touch back delivers extra comfort. 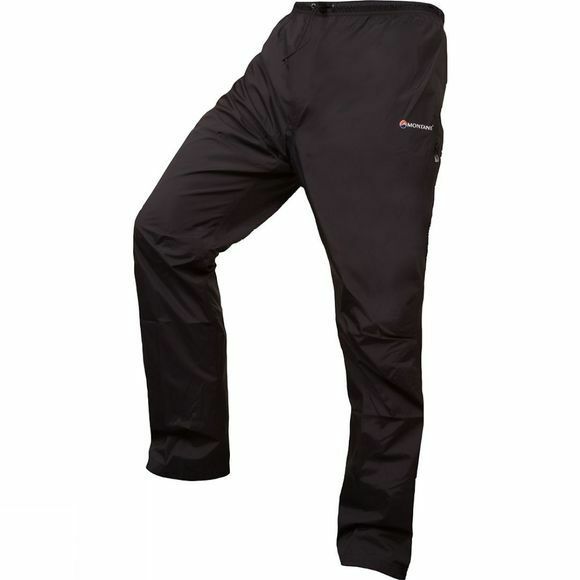 The tailoring includes a diamond crotch gusset and articulated knees for ease oif movement, perfect for mountain use. Hook and loop tabs allow you to reduce the volume around your calves to minimise wind resistance and the likely possibility of abrasion on the inner lower leg. Press stud ankle adjustment also allows a tight fit against footwear and helps to prevent heat loss. Three-quarter-length side leg zips allow easy access, thigh ventilation and the ability to pull on the pants without removing footwear. An internal storm flap behind each zip increases weather protection.